This challenge will run through the month of May. We will post updates in *this* private Facebook group and I will post them on the blog. I think it will be easier to have everything in place. Please only join the group if you are going to participate in this challenge. Also note, to save time I will not be watermarking pictures. So, what is a protective style you ask? Well, a protective style is simply a way to protect the hair from constant manipulation (detangling, styling, etc) and to protect the ends from other harsh elements! Protective styles include: Box braids, two strand twists, buns, cornrows, bantu knots. There are a few rules, of course. 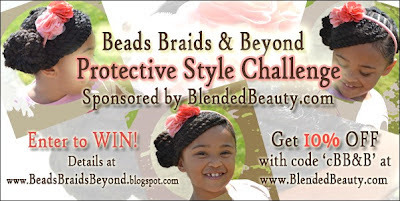 1) No beads, barrettes or rubberbands during this challenge. 2) No heat (flat irons, curling irons, blowdryers, etc) during this challenge. This is only one month long. You can have up to 4 styles or you can just have one, completely up to you! I encourage you to try to make your protective styles last longer for less manipulation though. Is that possible to make braids or twists with yarn ? yes. chocolate hair vanilla care has many yarn twist/braid styles. How do you secure the ends w/o rubberbands? Can we use scrunchies? Is it too late to enter this challenge?